Metal Roofing has been gaining popularity with the increasing interest in energy-efficient roofing materials. They are not only used for commercial buildings, but are an attractive option for residential roofs as well. American Renovations LLC has installed a variety of metal roofs for customers who want a durable and low maintenance roof that is also aesthetically pleasing. You can rely on American Renovations LLC to perform your metal roof installation with the highest standards of craftsmanship. Today’s metal roofs are made to look like other roofing products. They can be any texture, pattern or color. There are metal shingle roofing; metal tile roofing and metal shake roofing materials available, along with a wide variety of other metal roofing products. With our extensive knowledge of metal roof materials, American Renovations LLC can expertly install or repair your metal roof. Metal re-roofing is also a great option for those who want to change to a more sustainable roofing material! American Renovations LLC would be happy to give you more detailed information on the many different products for metal roofs and show you how we could enhance your home or building with these innovative materials. 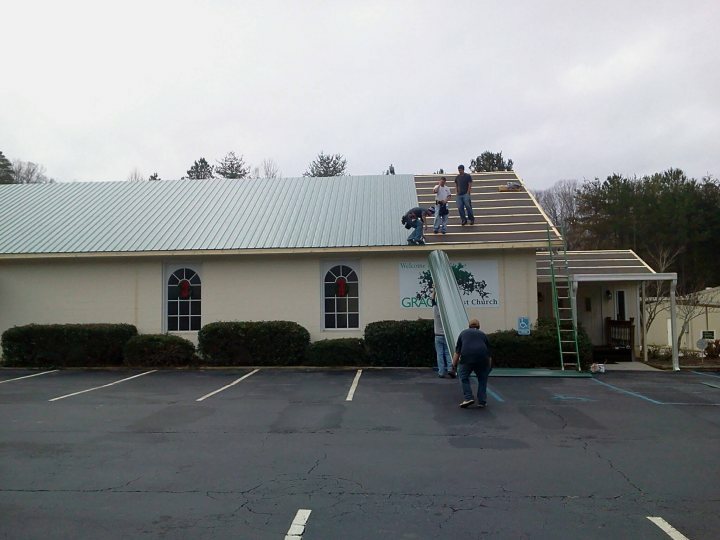 If you choose to re-roof or install a metal roof, call American Renovations LLC at (864) 280-7002 and one of our experienced metal roofers will be happy to discuss benefits and options with you.